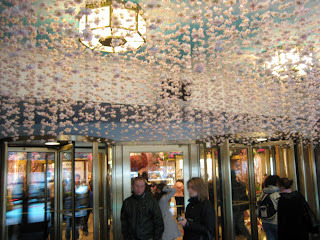 The Broadway marquee entrance: magical! 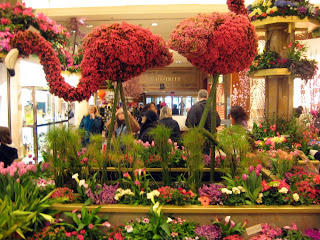 The flamingo rules this Flower Show. Unfortunately, I kept calling them pelicans and George (raincoat shopping post tomorrow) had to keep correcting me. Not so up on my water birds. The walls on the first floor are covered in displays. 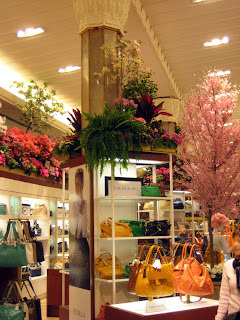 Pretty bags with flowers. A dangerous combination. The sights and smells are intoxicating. Visit NYC Mama if you have kids to read about the calming spell the show put on her children, thus allowing her to buy dresses. Very clever, Macy's. 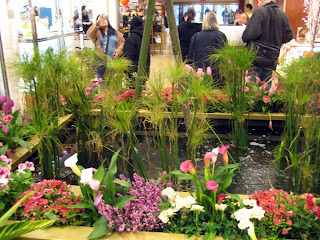 The flower show is up until Saturday, April 18th. Visit and you'll leave wishing all our buildings could look and smell that good year-round. Happy snowy Spring! i was waiting for you to post about this! 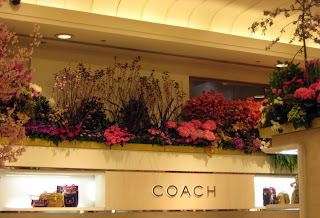 it's never spring until the macy's flower show. must stop by tomorrow and breathe in the smells. i wonder what they do to sales associates on the floor if they have flower allergies? are they temporarily relocated? It looks simply gorgeous! The entrance display especially. Ooooh! You are snagging the Flamingoes for us after the show, right?! It does look inviting. I'm going to start calling them pelicans, in solidarity with you. 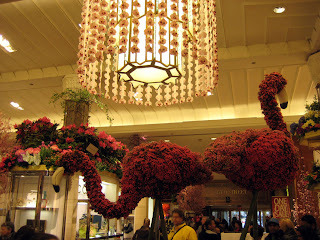 Love the Macys flower show! Thank you for going over there to post these pics....cannot WAIT until Spring, right?